Arduino Programming is an agile and intuitive programming technology which is designed especially for developing the programming skills through sketching in source code. It refers to the process of instructing computers to perform tasks for you through an effective programming language at C and object oriented platform without the constraints and requirements of programming languages. The programming language which is used in this field can actually be expected to perform numerous roles including technical roles that usually include computers to perform certain tasks and conceptual roles that refer to using a more conceptual framework when organizing your ideas about different processes and things. Arduino Programming is safe and based on modern programming paradigm which adds features that makes the programming easier to use, more flexible, interesting and efficient. Arduino Programming is specifically recommended for microcontrollers, micro computing and embedded computing devices. These devices can be quoted from real life such as heat controller and regulator of electric oven, motion or sound control systems and objects with interesting behaviors. Arduino Programming has introduced new features for writing codes that are deemed as user friendly with unification of procedural and object-oriented portion of the language. If you want to learn Arduino Programming and become an effective certified programmer especially for microcontrollers and automated programming environment and devices, then this certification course available at Brainmeasures as your best ally. This specific programming course works in increasing the level of your understanding about the programming field or industry so harnessing your skills in this area will no longer become impossible. With the help of the Arduino Programming which is provided by Brainmeasures, you will get the chance to learn more about how Arduino Programming works and the things that you need to perform the whole programming process. 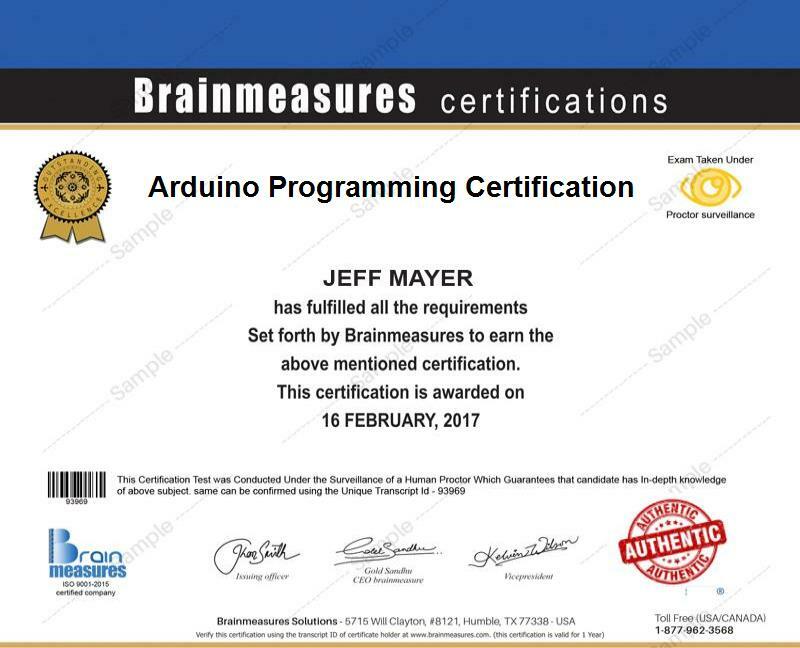 Once you receive the Arduino Programming certificate from Brainmeasures after passing all requirements including an online comprehensive exam to hone your knowledge and skills, you will find it easier to impress different companies with your skills in the field of micro processing, micro controlling system, efficient programming and software development. Completion of Arduino Programming certification course also allows you to enjoy a more rewarding career because it works in improving the stability of your income and salary. With the presence of your Arduino Programming certification, you can easily seek good position and can earn around $83,000-$100,000 annually. This is just a numerical estimation which may go far beyond based on innovation and creativity in sketching codes, designing programming architectures and intuitive development abilities especially micro controllers and processors in the field of programing. Anything that you want to learn about microcontroller programming and device controlling and programing mechanism at Arduino Programming platform which forms part of the prestigious certification program offered by Brainmeasures so it is safe to make an assumption that it is capable of supplying numerous benefits to individuals and professionals computer science, IT and software engineering. It works suitably for all aspiring and existing programmers and developers who wish to further improve their knowledge in the field of software engineering, micro processing, micro controlling, embedded programming designs, software designing, software programming and continue to develop programs with agile and intuitive techniques that will be extremely useful at multiple platforms especially for self-controlling systems.